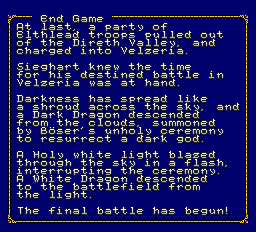 Crest of Gaia has to be THE most generic strategy RPG I’ve ever played. Seriously. 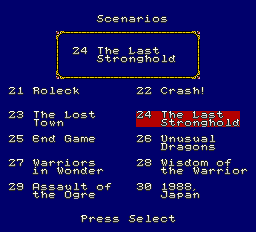 I guess if you’re into the whole SRPG thing, you might derive some enjoyment from this game, but I sure as hell can’t. 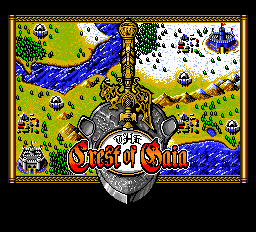 Unlike more contemporary games in the genre like say, Shining Force and Dark Wizard, Crest of Gaia doesn’t bother to do anything to spice up the experience in terms of presentation, making the whole thing agonizingly boring. While the previously mentioned games have nice things like animated cutscenes, character development, not-unacceptably-horrible graphics, and…you know, fun, Crest of Gaia does away with these frivolities and delivers an experience that can be best described as being both bare-bones and dull. Dull as all get out, for reals. About the only reason I can see anyone playing this is because it apparently has some tie-in with the Langrisser series. Otherwise, there doesn’t seem to be anything in this game that would warrant you spending your time on. Then again, maybe I’m just bitter because of the game’s intentionally misleading intro, which shows a knight in full armor riding on a dolphin’s back. Imagine how crushingly disappointed I was to find out that there is, in fact, no dolphin riding to be found in this game. Don’t be fooled! Update: Apparently, according to the big D himself, you CAN ride dolphins in this game! This completely nullifies any negative opinions I may have expressed above - Crest of Gaia is awesome. 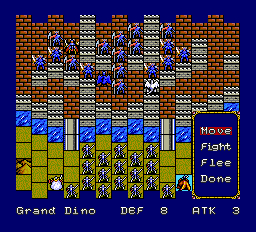 Also the game’s more like a strategy/board game sort of thing than a strategy RPG but whatever. Dolphin riding knights, man. Who ride dolphins. Seriously! The patch is in BPS format. A patcher “beat” can currently be found here. All graphics and text are completely translated, with extra work going into the translated script in order to make it clearer in meaning than even the source material.